Kurdish parties, militants and their alliances have developed into major factors in the Syrian, Iraqi as well as Turkish war theaters. Although Kurds have been a significant regional factor since the mid-1980s, their role in the region became more prominent in 2015 and increasingly so after the attempted military coup in Turkey on July 15, 2016. This article attempts to analyze available intelligence to add perspective to a situation that is mired in confusion and wrapped in misinformation. The Kurdistan Democratic Party (KDP) in the semi-autonomous, predominantly Kurdish region of northern Iraq and Kurdish Peshmerga fighters. The Turkish Kurdistan Workers’ Party (PKK), including its political and military wing. The PKK splinter group the Kurdistan Freedom Hawks. The Democratic Union Party of Syria (PYD) and its military wing the YPG and its all female YPJ. The YPG/YPJ constitute the majority of the forces which are fighting under the banner of the so-called Syrian Democratic Forces (SDF) which also include fighters from other ethnic groups including Armenians. The KDP government in northern Iraq, led by Massoud Barzani, as well as Peshmerga fighters have, since the overthrow of the Iraqi government under Saddam Hussein, been supported by the United States, primarily, and by several EU and other NATO member States, secondarily. The KDP regional government has also been one of the primary beneficiaries of the Islamic State’s trafficking of stolen Syrian oil via northern Iraq to Turkey and beyond between 2013 – 2016. It is noteworthy that this oil business, that weakened the Federal Iraqi government in Baghdad as well as the Syrian government in Damascus got a significant boost after the European Union, in April 2013, lifted its ban on the import of Syrian oil from “rebel-held Syrian territories”. In mid-August 2016 Massoud Barzani stressed that independence of Kurdistan was the only remaining option. 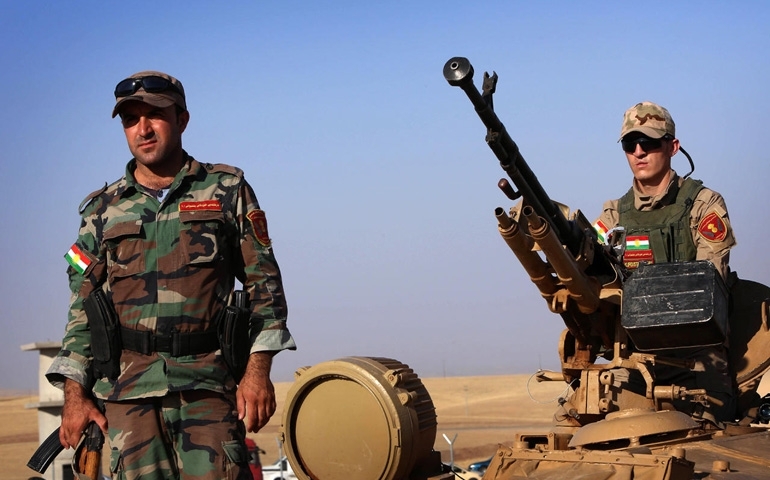 Iran has, since the invasion of Iraq by ISIS in 2013 tentatively approached the KDP administration politically, and to some degree coordinated Peshmerga fighters’ and Iranian-trained Iraqi popular militia in the struggle against ISIL. U.S., European and Turkish support of the KDP aimed at several strategic objectives. The destabilization of the federal government of Iraq and the division of Iraq into three States. The overarching NATO strategy that aims at challenging Russia and Russian influence from the eastern Mediterranean, along Russia’s relatively soft and resource rich southern flank, to Pakistan. The Kurdistan Workers’ Party of Turkey (PKK). The PKK began its armed insurrection against the Turkish State in 1984. That is, before the end of the cold war and the discontinuation of the Soviet Union. The PKK’s struggle was launched with the goal to establish an independent Kurdish State. Its political philosophy is non-dogmatic, non-sectarian democratic socialism. The PKK has, since its inception, been supported by the Soviet Union and it continues to enjoy goodwill from Russia today, although that support is not overt. As a historical footnote it is worth mentioning that SIPRI reported that Germany, after its reunification, presented East German, Soviet-made armored personnel carriers and large-caliber machine guns to Turkey under the condition that the equipment only be used against the PKK. The logic and strategy behind Moscow’s alliance with the PKK is that the PKK could function as a Soviet / Russian version of what NATO would describe as “stay behinds”. The PKK could, in other words, be used to challenge or contain NATO and NATO member Turkey in the case of a conflict. Former Turkish Military Intelligence Chief Haki Pekin and other hard-core Turkish nationalists stated to this author that the PKK is “an agent of the USA and Israel” and cooperates with the AKP government and the USA to “Balkanize” Turkey. The author has, however, not seen any conclusive evidence that would substantiate the claim. It is also always advisable to be cognizant of the fact that “former intelligence chiefs” and others, often have an undisclosed agenda that determines what information they disseminate and when. General (retired) Pekin and other Turkish ultra-nationalists were strongly against the AKP government’s peace talks with the PKK which broke down in July 2015. Another interesting piece of intelligence are documents this author recently received, that show that the federal government of Iraq has several hundred PKK fighters on its payroll, paying about 1,000 US dollar per months per fighter. These documents appear, as far as this author can discern genuine, but it is difficult and extremely costly to have them independently verified. The source whom this author received these documents from purports that Baghdad supports PKK fighters in northern Iraq so as to weaken the influence of Massoud Barzani, the KDP and Peshmerga. This policy would plausibly be consistent with the interests of both Moscow and Tehran, but it is important to distinguish between intelligence and analysis. The Kurdistan Freedom Hawks is a PKK splinter organization that primarily focuses on small-scale attacks, terrorist attacks, bombings. Its resources are severely limited and its membership is estimated at maximum 200. The organization is, according to this authors sources in Turkey infiltrated and in part controlled by both Turkish and NATO intelligence and used as an instrument to discredit the PKK as well as the HDP. Relatively minor attacks attributed to this organization have repeatedly been used as a pretext for Turkish military operations in southeastern Turkey and crackdowns against advocates for the Kurdish discourse in Turkish politics. The Democratic Union Party (PYD), the YPG, YPJ and the SDF. Syria’s Democratic Union Party (PYD) also has its roots in the mid-1980s. The PYD and its military wings, the YPG and the all female YPJ are traditional allies of the PKK. The PYD’s and PKK’s also share their in-dogmatic approach to democratic socialism. It is noteworthy the the Syrian Baath Party government in Damascus never “approved of” the PYD but that the PYD – YPG – YPJ nexus was part of Moscow’s and Damascus’ “containment strategy” directed against Turkey and NATO. It is also noteworthy that relations between the PYD and the Iraqi KDP , despite occasional pragmatic cooperation, are as tense as relations between the PKK and the KDP. Relations between the Baath Party government in Damascus and the PYD soured after the YPG /YPJ began receiving military aid including military advisers, special forces and “volunteers” from the United States, and the PYD began aiming at an independent State construct in northern Syria. Russia, for its part, recognizes that the YPG / YPJ and the Syrian Democratic Forces have been among the most efficient fighters against the presence of the Islamic State (ISIL) at the Turkish – Syrian frontier. Moscow has repeatedly called for the inclusion of Kurds in the Geneva talks on Syria. The Turkish AKP government denounces the PYD and its militants as PKK-allied terrorists and strongly opposes their presence along Turkey’s southern border. Sources on the ground in northern Syria reported to this author, days in advance of Turkey’s invasion of Syria’s Jarablus region, that ISIL fighters were withdrawing from the district. Information received after Turkey’s cross-border invasion with participation of units of the Free Syrian Army (FSA) detailed that the Turkish military and the FSA were, indeed, fighting Kurdish forces rather than ISIL. Needless to say that the situation pertaining all of the Kurdish parties in the region is complex. Utilitarianism and Realpolitik are the parents of the strangest bedfellows. It is worth noting that Kurds are the largest ethnic and national group that has no State. It would take another article to explain the situation of the Kurds and their aspirations for independence from a perspective of international law. Briefly, the Kurdish discourse pits the internationally guaranteed right to self-determination against the equally valid principle of States’ right to territorial integrity against each other. Simplified; The UN General Assembly’s 1970 Declaration of Principles stipulates that both principles are equally valid but that the one cannot be implemented if it violates the other and vice versa. In practical terms this means that Kurds depend on the five Permanent UN Security Council members (P5) who have the mandate as well as the obligation to resolve the issue of Kurdish sovereignty and self-determination versus the territorial integrity of Turkey, Syria, Iraq, as well as Iran. The problem is that the principle players at the UN Security Council use Kurds as geopolitical pawns. That said, who could blame Kurdish parties for forging alliances based on similar utilitarianism, Realpolitik, and for continuing their struggle, using all available means and purported “partners” that are at their disposal to achieve a long-term strategic objective.